Last week I picked up the bicycle frame from the powder coater and I was quite pleased with the end result. 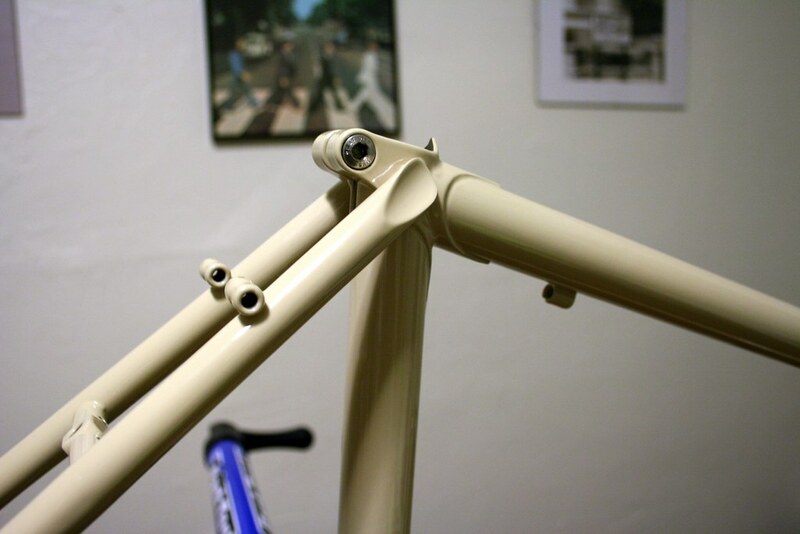 I was expecting the thickness of the powder coat to cover up a lot of the detail in the lugs, but the tan color actually worked in favor of the details. It created a contrast between the shadows at the edge of the lugs that really helped the lug stand out. The powder coat had a couple of small surface imperfections, but you would have to be looking for them to find them in my opinion. And upon closer inspection of the bicycle, I was able to find some spots that were out of alignment by several millimeters, but it would be hard to spot them unless I pointed them out. So I won’t. All in all, I am still very pleased with the frame for a first time attempt. I’ve been busy researching other frame builders’ methods and looking at pictures of shop setups. I’m starting to get an idea of what tools I will buy and what methods I would change for my next attempt, but am sure I will have even more ideas after the second bicycle frame and so on. I would also be interested in possibly sharing tools and shop space with another builder in or around San Francisco. Since I work full-time, there would be a lot of idle time when I would not be using the tools. Just throwing that out there. I took a few more picture and posted them on Flickr.